Home > French Blog > French Culture > What to Expect at a Typical French Wedding? 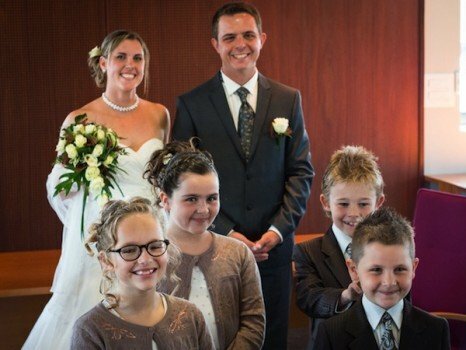 In May, we were invited to the wedding (un mariage, note only one R) of my dear cousin Coralie and her fiancé Thibaud. As I was describing the ceremony etc… to my Skype students, I was surprised to see how fun it was for them, and all the questions they asked about a typical French wedding. A few months before the wedding, you will receive “un faire-part”. This is a formal and pretty printed letter which informs you of the wedding, and if it’s a religious one, invites you to join the mass/religious ceremony at the church, and maybe will invite you to a drink after the wedding. You don’t need to RSVP (did you know this was French? it stands for “répondez s’il vous plaît” answer please) this part, but it’s never a bad idea to do it. If you are part of the lucky few, there will be an additional card in the letter, inviting you to the “repas de noce”, the meal. You do need to RSVP, so the wedding party can know exactly how many people are coming, and order food and prepare the table plan accordingly. When you RSVP, unless otherwise mentioned, you send the card back with a note to the members of the family you know: the parents of the bride – les parents de la mariée, or the parents of the groom – les parents du marié, or directly to le/la futur(e) marié(e). Addresses will be provided. The faire-part may also mention where the bride and groom are registered – la liste de mariage. Although it’s traditional to have one, many couples nowadays have been living together for some time, and don’t need anything special for their household… In this case, it’s usual at la reception – the wedding reception, to have somewhere a box in which you can slide a card and a check. Traditionally, it was the parents of the bride who paid for the wedding. However, this is hardly the case anymore, and most of the time, people do… what they can! If the parents are paying for the wedding, they may divide the cost per guest, and pay for the guests of each family. Often nowadays, the parents give some money to les futurs mariés, who pay for the rest themselves. So it is very much expected from a guest to partake financially – either with a nice gift, or with a generous check which may help pay for the wedding, or for a honeymoon – le voyage de noce, la lune de miel. We do have however flower boys and girls: les enfants d’honneur, une demoiselle d’honneur, un garçon d’honneur. They usually are dressed all the same, in fancy outfits. Traditionally, the bride will wear a white or off-white fancy dress – la robe de mariée. Just like in the US. This dress is often princess-like, and may have une traine, the bride may wear un voile – a veil, and of course the bride will hold un bouquet. I believe it’s much less of a tradition in France to try to wear your mother’s dress, at least I’ve never heard of anybody doing it. The groom will wear a suit – un costume, or a tux – un smoking. The guests are expected to dress up. Hats are not out of the question (a woman can wear a hat in a church, a man cannot). Traditionally, a woman guest should not wear a white dress. French people usually dress more “classic” than Americans. We favor fancy fabrics over beads, and will wear pretty conservative cuts: nothing too clingy or low cut. In other words, people won’t dress at a wedding like they would at a New Year’s Eve party, it’s going to be more conservative. As we’ll see below, the wedding can be an all-day affair. If it’s the case and your hotel is nearby, you may change before the evening /dancing part of the wedding, but you’ll still need to wear something fancy. The French government strictly applies the separation of Church and Government. For this reason, a priest can only marry you in the eyes of the Church, not legally for the French administration. he big day usually starts with it, and if it is to be followed by a church wedding – un mariage à l’église, then only the close family and friends are invited (the room is usually not very big). It’s usually quicker if there is to be a church wedding, and some traditions may be left for the church (like the exchange of the rings). Yet, the city hall wedding is the real thing, and the couple is officially married after it! The newlyweds will walk from the city-hall to the church, or they may take a car (usually decorated with ribbons and flowers)… At the Church, the groom will be waiting for the bride. Traditionally, he will be standing to the right, and she will be standing to his left side. Families and guests may seat accordingly behind them. Les enfants d’honneur will lead the way, as the father of the bride guides her to her husband. Then the priest will officiate: either a full mass, or just a blessing. Some family members and friends may read a prayer, or sing a song. The audience may be coaxed to sing, the ambiance is more or less formal, it very much depends on the priest. At Coralie’s wedding, since most of the audience didn’t know the song, we ended up clapping in rhythm; it was very cool! At one point, les enfants d’honneur will pass a basket for church donations – la quête: it’s expected of the guests to leave something, but this will go to the church, not to the newlyweds. So you need to bring a little cash with you. At the end of the church ceremony, everyone will exit the church while the witnesses and newlyweds stay in and sign the registers. Les jeunes mariés will leave the church last, and usually people will throw rice or petals (real or fake) at them when they exit the church. 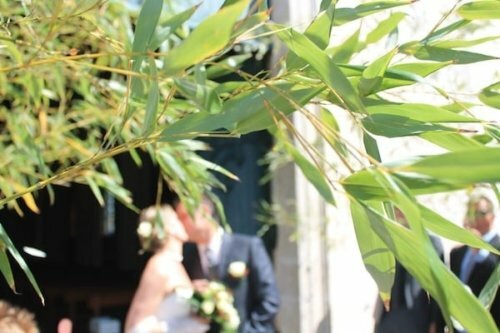 At Coralie’s wedding, their friends had brought some long branches, and were forming a dome outside of the church door: I had not seen this tradition before – it maybe a regional one – but it was really pretty. Then, there is usually a ton of pictures, and then people move on to the next step, “le vin d’honneur” or the “repas de Noce”. This doesn’t happen all the time, but it’s pretty common, especially when the families know many people. Before the wedding meal, there will be sort of un apéritif, with drinks (wine and Champagne and juices) and finger food. Many people will attend – at Coralie’s wedding, we were about 300 I believe! This gives a chance for distant family members, colleagues, people of the village to présenter leur voeux – give their wishes to the newlyweds. There will often be a table somewhere with un livre d’or – a guestbook where you can leave a kind note, and maybe box for donations – for the newlyweds this time!! Coralie had something fun: a painting of a tree trunk, and 5 different shades of green ink: guests were to press their finger on the ink, and then put their fingerprint on the painting, hence adding a “leaf” to the tree. The end result was really charming. But in France, most towns own what is called “une salle des fêtes”, a party hall, which can be rented to the citizens for occasions such as a wedding. These halls vary tremendously from town to town, but Coralie and Thibaud were lucky to have access to a great one: modern, spacious, pretty and very well equipped. There is a professional kitchen, a huge hall with a stage, a smaller conference room, a place for the coats, and many toilets. The hall has sliding doors and can therefore become two separate rooms. In our case, le vin d’honneur was held in one room, and the repas de noce, the wedding meal, in the other one. After all this food, more food! It’s traditional to have a seated meal. The seats are assigned: look in the room for a board with your name which will assign you to a table. At the table will be a little name tag. If it’s a seated meal, there will be a caterer – un traiteur – to serve the meal. It’s going to be a big meal, so be ready to stay at the table for quite a while… Depending on the wedding, it could also be much less formal and a buffet, free sitting kind of situation. In any case, food and alcohol are provided for free, and readily available if not served to you… I have been to several American weddings where people needed to go to a bar to order drinks – and pay for them unless it was an “open” bar. I never heard of anything like that in France. The choice of alcohol will however be limited to wine and Champagne. The meal will end with a wedding cake. Traditionally in France, it’s “une pièce montée“, with custard filled puff pastries and something called “nougatine”: honey and nuts. Yummmmmm !!! During this meal, nowadays it’s very likely that you’ll have some kind of a show: a powerpoint presentation of the newlywed’s lives is to be expected. Embarrassing pictures of them as kids. Some friends and family members may sing a song or two. Coralie and Thibaud have an awesome group of friends, and obviously, like to party!! The ambiance of the wedding was not too formal, and so the friends and family did a real show, including songs, line dancing, belly dancing, and even a Chippendale kind of show !! All was done in good spirits, and very funny, and we all laughed a lot. French people love to dance. So after the meal, everybody went to the other room (which had been cleaned from the previous buffet), and started to dance. First, the newlyweds, then the parents, then everybody joined. First ballroom valse, then the party went on till 5 AM… There was a great band! They are too many to list. There are many regional traditions, and also family ones. At Coralie and Thibaud’s, we all made a big circle and danced around and then under a huge brioche – bread specialty – that was held by two men and formed a bridge, then we ate the brioche. Then later, the newlyweds danced under a big umbrella as all the guests threw paper ribbons over them. At 5 AM, we ate an onion soup – une soupe à l’oignon! So as you can see, many traditions are the same in the US. then other points differ. One thing is certain: Coralie and Thibaud’s wedding was wonderful, full of love and great memories. It was fun to share this day with you, I hope you will have the chance to be invited to a French wedding and experience it for yourself. Here is an article about some of the red tape involved in getting married in France.